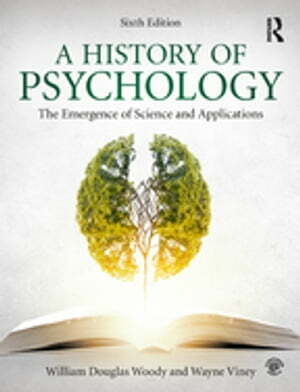 Collins Booksellers - A History of Psychology by William Douglas Woody & Wayne Viney, 9781134837151. Buy this book online. A History of Psychology: The Emergence of Science and Applications, Sixth Edition, traces the history of psychology from antiquity through the early 21st century, giving students a thorough look into psychology’s origins and key developments in basic and applied psychology. This new edition includes extensive coverage of the proliferation of applied fields since the mid-twentieth century and stronger emphases on the biological basis of psychology, new statistical techniques and qualitative methodologies, and emerging therapies. Other areas of emphasis include the globalization of psychology, the growth of interest in health psychology, the resurgence of interest in motivation, and the importance of ecopsychology and environmental psychology. Substantially revised and updated throughout, this book retains and improves its strengths from prior editions, including its strong scholarly foundation and scholarship from groups too often omitted from psychological history, including women, people of color, and scholars from outside the United States. This book also aims to engage and inspire students to recognize the power of history in their own lives and studies, to connect history to the present and the future, and to think critically and historically. For additional resources, consult the Companion Website at www.routledge.com/cw/woody where instructors will find lecture slides and outlines; testbanks; and how-to sources for teaching History and Systems of Psychology courses; and students will find review a timeline; review questions; complete glossary; and annotated links to relevant resources.